Do you ever feel like you're in a scrapping slump? We're here to help with a super easy sketch challenge. We want to see your take on our sketch using any papers or products. The 'Top 3,' as chosen by our Design Team, will have bragging rights with a 'Top 3 fave' button to display at their own blogs + everyone who participates will be entered to win the prize for this challenge. Prize = $25 gift certificate to shop at www.shopquickquotes.com (woohoo!). I love the possibilities that this sketch has. 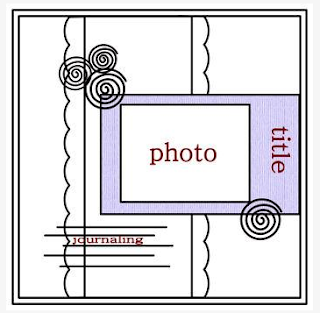 From changing up the scalloped border, to seeing what different embellishments could have been used around the photo. I had fun 'playing' with my LO. I used Quick Quotes' Savvy Davvy papers + coordinating alphabet quote sheet. I also added Creative Imaginations shimmer mist in teal, plus used a Martha Stewart 'loops' punch & various buttons to finish off the look. ITEMS USED: Quick Quotes French Quarter papers, Quick Quotes Frosted Flourishes, cardstock by Stampin' Up, Spray ink: Shimerz Bed of Roses & Tattered Angels Gumdrop, Embellishments by Jillibean Soup - Heart Sugar Pick & Karen Foster - Prom Stickers. 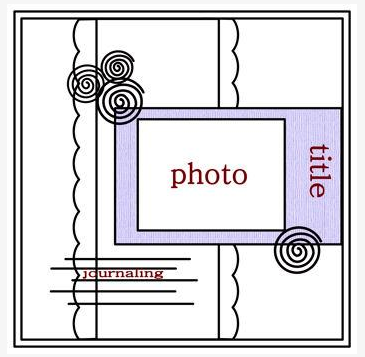 Various dies - my favorite things: scallop border & memory box - whimsy circle. TIPS/TRICKS: I started off by rotating the sketch. Then I used the QQ Frosted Flourish as a mask to spritz around and give my ivory cardstock some color. I spritz some of the QQ papers as well to match. When I was done spritzing I just cleaned off the mask and was able to use it on my layout. Great projects gals! What a Adorable little Cutie Lisa, great pics for a great page! And love the misted areas on your page Anita, I really need to try that, and love that you used the swirls also on the layout, which is great by the way! lisa, i love the sketch and the layout you created for it! anita your layout if beautiful!